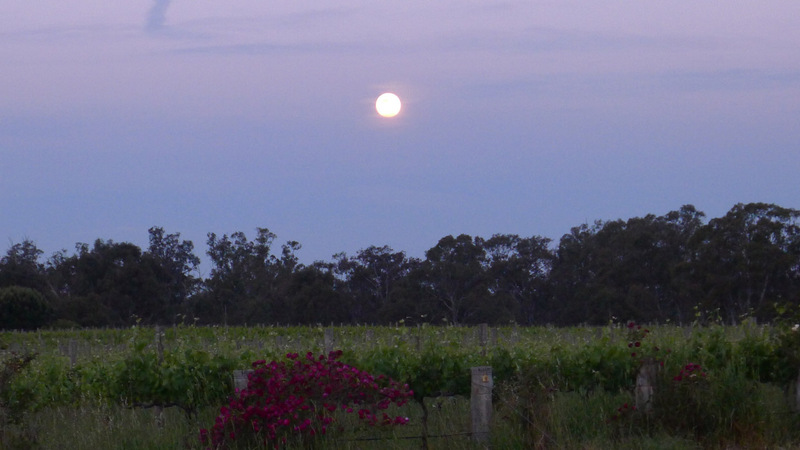 MOON wine comes from the Goulburn Terrace vineyard, on the banks of the Goulburn River at Nagambie, in Central Victoria. We try to work as naturally as possible. In the vineyard we follow organic and Biodynamic principles - certified by NASAA. In the winery, the grapes are transformed into wine with a minimum of intervention. Most fermentations are allowed to start spontaneously, generally little or nothing is added, we never fine the wines, and rarely filter them. Our wine styles are very traditional, perhaps a bit old-world. The emphasis is on building structure and complexity. The wines tend to be savoury, with fruit characters contributing to the deliciousness of the wine without dominating the palate. Where wines are fermented or matured in barrels, we use only French wood, mostly old, so that any oak flavour is subtle. The wines are at their best with food, and are served in fine restaurants and wine bars around Australia. They are carried by a few specialist wine shops, and you can buy them direct from us through this website. Our Cellar Door is at Nagambie, in the historic old General Store at 340 High Street. It is open several times a year, on days that are announced to our mailing list members. At other times, we can open by appointment.